The people who became the Khoisan started to split off from other humans about 200,000 years ago (as DNA shows), and were completely separate from other people by 100,000 years ago. They arrived in South Africa, either walking south or paddling small boats along the coast, at least 80,000 years ago. Like everyone else in the world at that time, they were hunters and gatherers. They knew how to control fire. They made stone and shell beads for jewelry, and buried their people with red ochre. Sometime around 65,000 BC, they seem to have invented bows and arrows. 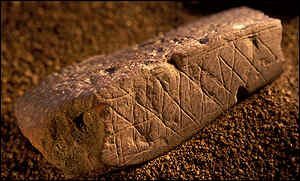 By about 25,000 BC, South African people had developed new ways of doing things, and we can start to call them by their modern names, the Khoikoi and the San. The Khoikhoi and the San spoke a language called !Kung. Their artists created rock paintings and rock carvings. They kept painting these rock paintings – we have some from about 11,000 BC – and then by about 7800 they started to paint a lot more of them. They were still painting the same kind of rock paintings in 800 BC. Around 400 AD, both the Bantu and other people living to the north, in central Africa, moved south and pushed the Khoikhoi and the San off their usual land. Some of these invaders were farmers, and some were sheep and cattle herders, and because they farmed and herded there were more of them than there were Khoikhoi or San. And in addition the invaders had iron spears and iron arrowheads. Both the Khoikhoi and the San were pushed into deserts and less desirable land, that was no good for farming. There are a lot more paintings which can be dated to around the time of the invasions, between 200 BC and 500 AD. In response, some of the Khoikhoi in Zimbabwe and the Cape began to herd sheep. Archaeologists find the bones of the sheep starting about this time, and also the Khoikhoi began to show sheep in their paintings. Before then, there were no sheep in South Africa. So the sheep probably came down from North Africa with the invaders. Dogs also probably came to South Africa with the Bantu invaders. The Khoikhoi seem to have begun to herd cattle (cows and bulls) around the same time, and there seem to have been big herds of cattle in many parts of South Africa by about 1000 AD. Possibly people started herding cattle in South Africa because of warmer weather related to the Medieval Warming Period. For some reason they did not paint pictures of the cattle. The San, on the other hand, who lived in south-east Africa, did not herd either sheep or cattle, but kept on hunting and gathering in the Kalahari Desert, in modern Botswana. Beginning about 1400 AD, the Little Ice Age made southern Africa much cooler than it had been before. Nobody knows yet how this affected local towns and villages though. Or check out this article in the Encyclopedia Britannica. Cite this page: Carr, K.E. 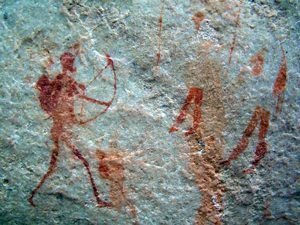 The Khoikhoi and the San – South African History. Quatr.us Study Guides, May 18, 2017. Web. April 21, 2019.